This week I did something that I’ve never done before. I got a pedicure. You can pick your jaw up from the floor now. Are you more shocked that I’ve never had one or that I actually did? It was an odd experience having a perfect stranger cleaning, rubbing, and snipping–scraping those cuticles. My cuticles were not cute. All the pampering got me thinking about my feet, which I usually don’t do, unless I’m shopping for shoes. Then, I think about them a lot. If you have feet that are lucky enough to be easy to fit, then I’m happy for you. I have large feet and shopping usually involves looking for my size first and the style second. Shopping for shoes when I was 12 years old and wearing size 10 was not fun. I was a puppy growing into my paws. It wasn’t easy finding kid-friendly shoes back then. Now, after two kids and letting comfort win, I wear 11. One day my husband surprised me by buying me two pairs of really cute shoes from a major department store that claims to be able to fit anyone. (Anyone with normal feet, maybe.) The salesman asked my husband if he wanted to try them on before he bought them. Hubby: I need these two shoes in a size 10. First, Mr. Rude Shoe Man, if he wanted to try them on, he would have said so. Second, they wouldn’t have fit him! When I returned the pair that didn’t fit, I told the salesman what happened. I’m fairly certain he had a really good laugh after I left. Where was I? Right, I’m getting my first pedicure and all this stuff is going through my head. The massage chair is punishing my entire backside and a stranger is prodding, filing, and rubbing on my sensitive feet. My frugal cheap self can’t imagine paying for a pedicure every month or so. I have to admit that I didn’t enjoy the experience that much–maybe because I didn’t know what to expect. And the tiny disposable flip-flops made out of thin craft foam that they gave me to wear so I wouldn’t mess up my toes didn’t even make it to the car before falling apart. 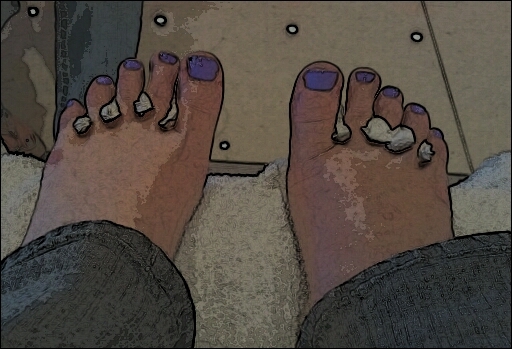 I do have very pretty purple toenails. My toes have never looked this good. They probably never will again.